Women are increasingly concerned about their own personal safety and want to learn more about personal self-defense. Firearms, along with proper training, empower women with a sense of freedom and security. Personal Safety Alliance provides a non-threatening environment where women can get the education and training necessary to use firearms safely and effectively to protect themselves. 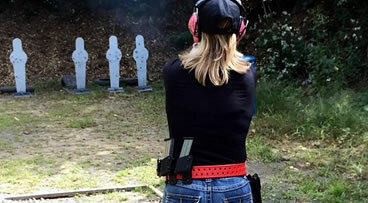 The goal of Jody's firearms training is to give women the skills and ability to confidently defend themselves. Women require hands-on training and shooting range practice to enhance skills and to overcome any fears or inhibitions preventing them from carrying a firearm. It's important to remember thatYOU...are responsible for your own safety. Personal Safety and Firearm safety is essential. Learn how to safely and effectively use a firearm. Contact Jody today! Do you want to learn to shoot? Special Introductory Offer For Ladies Only! This class is specifically designed for women who have always wanted to learn the very basics on handguns and self defense. We understand that learning how to shoot can be a scary and intimidating experience for a woman. We think that you will find this ALL Woman class very comforting.Classroom and one on one range time with female instructors. Learn the skills and attitude necessary to keep yourself safe! We will provide everything that you need including guns and ammo! You may bring your own gun and we will teach you how to run it or help you get comfortable with and fine tune your skills. If bringing your own gun you will need to purchase approx 50 rounds of ammo from the range. Dress Code: No sleeveless shirts, No open toed shoes Certificate upon completition. (Co-Ed) Designed to teach new pistol shooters a hands on introduction of handgun safety, handling, proper loading, unloading, ammunition malfunctions, and and the basic shooting skills necessary to place rounds on target. If a student wishes to take the class and has not yet purchased a pistol we will have .22's on hand to borrow. Perfect for new gun owners. You may bring your own gun and we will teach you how to run it or help you get comfortable with and fine tune your skills. If bringing you own gun you will need approx 50 rounds of ammunition which can be purchased at the range. (Co-Ed) Designed to teach new and experienced pistol shooters a hands on thorough introduction of handgun safety, handling, proper loading, unloading,ammunition, ammunition malfunctions, gun cleaning and and the basic shooting skills necessary to place rounds on target. If a student wishes to take the class and has not yet purchased a pistol we will have .22's on hand to borrow. Perfect for new gun owners or great refresher course. Satisfies WV and OH CCW requirements. Includes: NRA student packet, range fees, target, eye and ear protection. Student will need: Packed lunch/snacks/water, pistol and minimum 100 rounds of ammunition (.22 caliber if using our guns), owners manual, cleaning kit, pencil /pen / paper if you chooses to take notes. In this class you will learn how to safely handle and shoot a handgun, as well as being introduced to defensive shooting . The course ends with live fire on the range. Bring your own handgun or contact us to use a class handgun. Eyes and ears if you have them, if not we can provide them for you. Students will receive a copy of the 245 page book: Concealed Carry and Home Defense Fundamentals by Michael Martin, and a USCCA Certificate of Completion. Have you thought about trying competition shooting but are too intimidated to just show up? Here's your chance to find out what it's all about in a low key, fun, safe environment! You'll learn the do's, dont's, and heck yeah's! Participant's will review the etiquette of shooting a pistol match. We will introduce shot timers, range commands, scoring, and other verbage used on the range during a competitive match. When your done with this class, you'll be ready to go to your first USPSA or IDPA match. This sport is HIGHLY addictive!! The focus of this class is safety, etiquette and rules. This is NOT a shooting skills class! Drawing from a holster and re-holstering can be dangerous. It is very important that you learn how to perform this skill safely. In this class you will practice with SIRT guns and real unloaded guns in the classromm and finish with live fire on the range. You MUST be froficient in safe gun handling. You must have taken the Intro To Shooting Class or some other kind of formal training that has been approved by Personal Safety Alliance. Safety is our main priority. This course is aimed at the person familiar with handguns but wants to be more efficient with a defensive application for home or concealed carry. Tactics and techniques combined with realistic training scenarios to enhance defensive skill set for real-life circumstances. Topics include marksmanship, safety, presentation from ready and from holster, one and two handed shooting, drawing and firing, shooting from cover, shooting while moving, reloads and clearing, eye level and retention techniques, defensive mindset. This Skills and Drills class will be open format to allow for more range time. This class will be geared towards newer shooters who have completed our introductory courses but may not be ready to go to the range "solo", or for novice shooters who feel they could benefit from "extra help" to improve or expand upon their shooting skills. Class will be limited in size to allow for more individual attention, skill set evaluation and live fire practice with an instructor by your side. This is our instructors favorite class to teach! We love watching you improve! Anyone can benefit from taking a CSAP class - whether you're a runner, commuter, student, someone who travels for work, retiree, homemaker - this class is for you! Why am I missing? Why am I shooting left? What am I doing wrong? In this class the goal is for the student to be aware of the different reasons that they are not hitting their mark. After finishing live fire drills, the student will be given feedback on areas in need of improvement and how to make the necessary corrections. You will learn how, why, and when to dry-fire practice and how to safely establish and set up a dry-fire area. The instructor will demonstrate drills and lead students through a variety of different dry-fire drills that the student can perform at home for an efficient practice session with no wasted ammo. Build your skills prior to hitting the range! Make the most of your range time! The NRA Pistol Marksmanship Simulator Training Course is designed to teach first time shooters basic marksmanship fundamentals, firearm safety, sight alignment, aiming, trigger control, grip,stance,breath control and follow-through. Students completing this course will receive a certificate from the NRA. A simulator pistol will be use during this course of instruction. The Shot Indicating Resetting Trigger (SIRT) professional training pistol uses a laser light to indicate where students shots hit. The SIRT pistol has enough weight to feel realistic, it includes a removable simulated magazine and realistic sights. No LIVE Firearms or Ammunition will be used in any fashion during this course of instruction. Those individuals interested in advancing their skills and live-fire exercises should follow-up with additional training. Do you want to learn how to clean your gun? We'll teach you how, why and when to clean it. This is a fun, relaxing, casual class. If you shoot it is necessary to know how to properly maintain your firearm. If you don't have a gun, but are still interested in learning what is involved we can provide a gun for you. IMPORTANT: .22's are VERY TIME CONSUMING. Please be aware that we may not have time to field strip a .22. Absolutely NO AMMUNITION is allowed in the classroom. All guns will be checked at the door. NO exceptions! Are you overwhelmed with the thought of buying your first handgun? Join us for this seminar for women on what you need to know before buying your first gun. Buying a gun can be intimidating on so many levels for women. We will help you sort it all out in the class, so that when you are ready to go shopping, you will be armed with knowledge. You will feel more prepared and impress those salesman! Cancellation within 14 days of the course date minus $9 fee. The customer may transfer their payment to another available class, or gift it to a friend. If Personal Safety Alliance needs to cancel a class, customer will receive a full refund.